Osim profit drop by 28%, what does the chart tell us? Many people is talking about Osim today and their prediction on where Osim price will go. 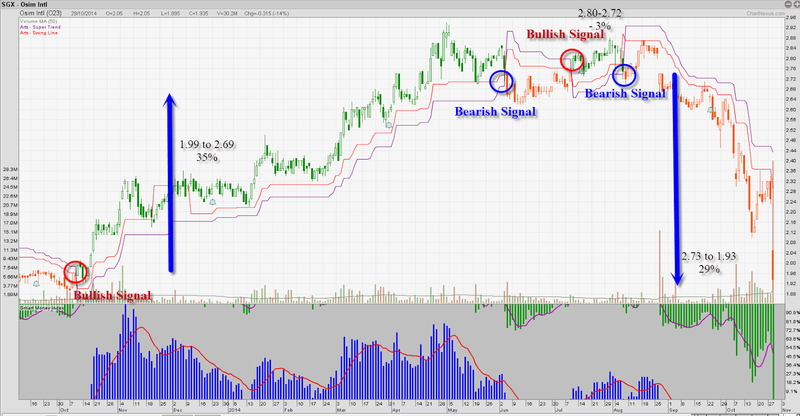 What we see is the big player selling already begin in late July where our system show a bearish signal. Previously Some analyst target that price will go above $4.60, during that time the company fundamental is still good, making money everywhere, i suppose that is why they give such a high target. We are different from many Stock guru out there, we trade Trend, not perspective. Buy uptrend, sell when trend change or when it hit your stoploss. That is why we trade using a system and not base on what other people THINK where the price will go. The price will go where the price is going to go, all we have to do is just Follow the trend. Currently our system show orange candle, so it is still no sign of trend change. Once again, our system is proven that it can help you to escape before a stock big crash. Although base on the previous post, our system came our with a buy signal, but soon after the price break 2.72, the system generated a Sell signal. In that trade, you make a 3% loss, which i think it is a small loss. If you have shorted at 2.73 till today closing price 1.93, that is a 29% gain. Isn't this Win big Lose small? You too can be a Stock Guru selling before it crash if you have followed our system.